After enduring a six-year legal battle over 2011’s “Margaret,” writer/director Kenneth Lonergan was probably just happy to see his latest movie get a drama-free release, at least comparatively speaking. The subject of an intense bidding war earlier this year at the Sundance Film Festival, “Manchester by the Sea” will almost certainly go down as the most devastating, heart-wrenching drama of 2016. An incredibly moving, intimate and authentic story about a broken man who’s forced to confront his demons, “Manchester by the Sea” is the kind of movie that will absolutely wreck you emotionally, highlighted by an award-worthy performance from Casey Affleck that’s going to be difficult to beat come Oscars night. Affleck stars as Lee Chandler, an unsociable handyman/janitor for an apartment complex in Boston who must return to his hometown of Manchester-by-the-Sea when his older brother Joe (Kyle Chandler) dies from a long-standing congenital heart problem. In addition to handling the funeral arrangements and other minutiae, Lee takes it upon himself to break the news to Joe’s 16-year-old son Patrick (Lucas Hedges), with whom he was once close to before a personal tragedy led him to flee the small fishing village for a life of solitude. But when Lee discovers that Joe has named him as Patrick’s sole guardian and custodian, it comes as a shock to both of them. Though Patrick would rather go live with his estranged mother (Gretchen Mol) than move away from his friends and established life in Manchester, Lee’s tragic past has made it impossible for him to remain in the town that has caused him so much pain. You’d think that a film about an uncle taking care of his recently orphaned nephew would already have its share of emotional conflict, but the death of Joe is nothing compared to the real tragedy at the center of the story. Intercutting the present day narrative with flashbacks to Lee’s relationship with Joe and young Patrick, his loving marriage to Randi (Michelle Williams) and the pivotal event that changed his life forever, Lonergan builds a rich tapestry that informs the audience of the man Lee once was and has since become. Affleck is phenomenal in the lead role, delivering a subtle but powerful performance that showcases an actor at the top of his game; there’s a profound sadness in his eyes and cracking voice that permeates every scene. Relative newcomer Lucas Hedges is also excellent as the hormonal teenager, forming a good comic rapport with Affleck that helps to balance the intensity of the drama without denigrating it, while both Chandler and Williams turn in solid work in small yet effective supporting roles. 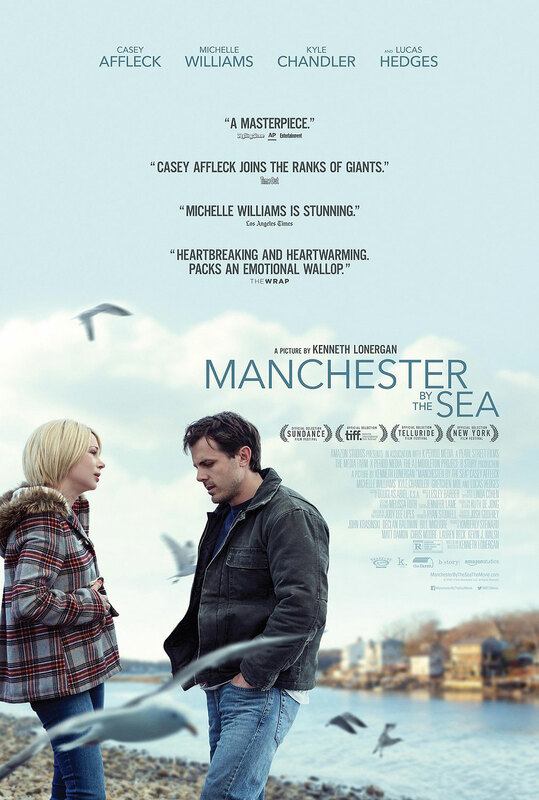 Though the movie is sprinkled with quite a bit of humor (much more than you’d expect for the subject matter), “Manchester by the Sea” is ultimately a portrait of grief and how it affects everyone differently. There’s no guidebook or one-size-fits-all remedy to fixing a broken heart, and Lonergan conveys that point beautifully amid the wintry, gloomy backdrop of his New England setting. Although Lonergan is perhaps a little too precious with the material as both writer and director, dawdling on insignificant subplots that could have easily been trimmed for time, for the most part, he shows great discipline and sensitivity in the way that he carefully peels back the layers of this deeply human story. “Manchester by the Sea” is heavy stuff, but for a film that deals mainly in misery, it never feels exploitative, and that goes a long way in earning your attention and respect.